Who wants to turn on the oven in the summertime? 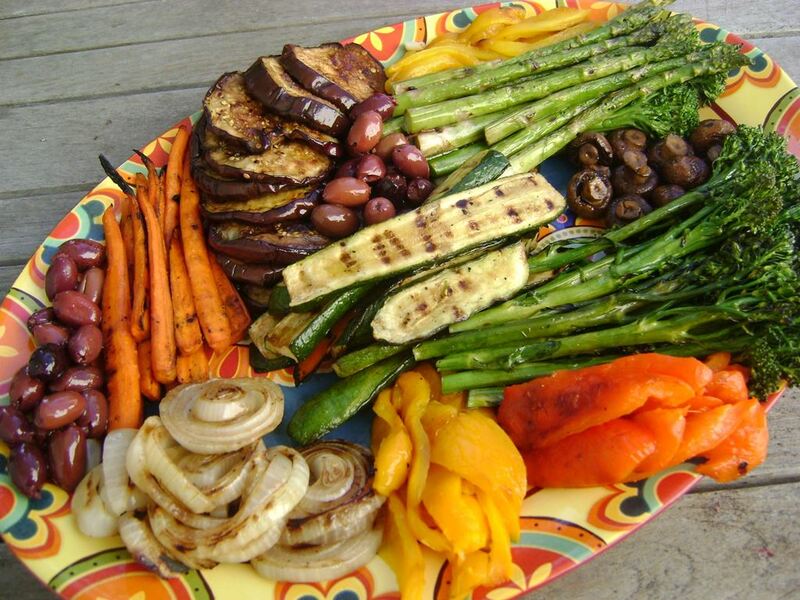 Summer days are meant for grilling, and summer vegetables are the perfect for the grill. If it’s too hot to even contemplate being outside during the day, you can grill these vegetables in the morning or in the cooler night temperatures. Plus the vegetables taste great hot, cold, or even at room temperature, so you have tons of wiggle room about when you cook it versus when you finally serve it. Carrots, baby broccoli, and asparagus: Peel or trim ends as necessary, steam for 3 to 4 minutes or until barely tender, lightly coat with extra-virgin olive oil, and grill over medium heat for 3 to 4 minutes on each side. Zucchini, onions, and mushrooms: Peel or trim ends as necessary, cut into slices 1/2 inch thick (no need to slice the mushrooms), toss in a bowl with 2 T. olive oil and 1 T. balsamic vinegar, toss to coat, then grill over medium heat for 2 to 3 minutes on each side. Eggplant: Cut into 1/2-inch thick slices, place into colander, coat generously with kosher salt, and then place something heavy (a plate or bowl) on top of the slices. Let stand for 1 to 2 hours (this should drain out any bitter juices). Rinse, pat dry, then coat with olive oil and balsamic vinegar as above, then grill over medium heat for 2 to 3 minutes on each side. Bell peppers: Place whole pepper directly on the grill, then grill for 3 to 4 minutes on each side, or until the skin is black and charred. Remove the peppers, place them in a bowl and cover with plastic, and let them sit for 15 minutes. Then core, remove the seeds, peel off the blackened skin, and slice. When the vegetables are finished, arrange them on the platter, drizzle a little extra-virgin olive oil on top, and garnish with black kalamata olives.